The Indian Ringneck has been a favorite of bird lovers for centuries due to its distinctive appearance combined with superior intelligence and an ability to speak. They are a very hardy species and will form a strong bond with their human companion if given the proper amount of attention. Native to Africa and Southern Asia, these birds are kept by pet bird owners all over the world. 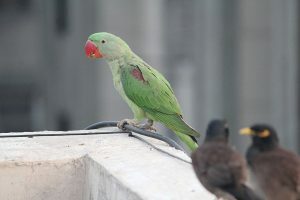 The Indian Ringneck’s scientific name is Psittacula krameri and there are three subspecies with slightly different coloration and widely diverse native ranges. It goes by many other names including the Ringneck Parakeet, Rose-ringed Parakeet, Green Parakeet and Long-tailed Parakeet. According to parrots.org, this companion parrot is found natively within a range extending from north-central Africa all the way west to Sri Lanka. Feral populations of this very adaptable bird have formed from escaped and released birds and exist in many cities throughout the world. 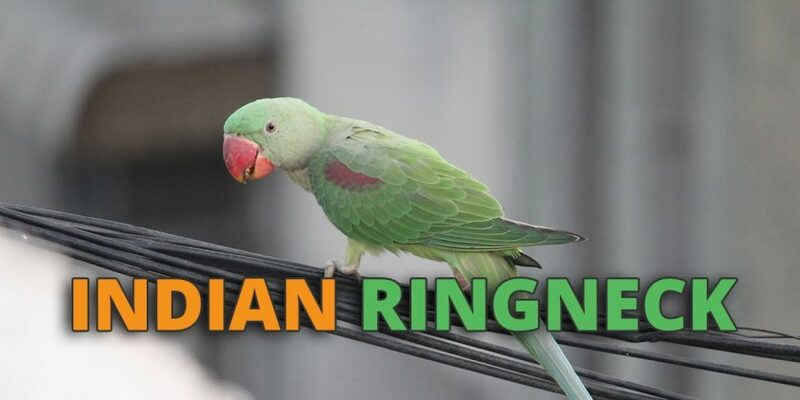 The natural coloration of the Indian Ringneck is greenish/yellow, but many color variations have been introduced through selective breeding. They have large, pronounced, reddish beaks tipped in black. They are sexually dimorphic with the males distinguished by a wide black stripe across their lower cheeks. The Indian Ringneck weighs between 4 and 5 ounces (160-140 g) and measures about 15.6 inches (40 cm). One of the reasons that these parrots are so popular is due to their striking good looks. Their bodies are generally monotone, with all feathers being of the same general color. Their bright red beaks stand out against their plumage, and the males, with their black stripe, can give the impression that they are wearing a helmet or mask. What Kind Of Personality Can I Expect From an Indian Ringneck? These birds are very active and rarely sit still for more than a few minutes. They can be temperamental and demand a great amount of attention to keep them tame. Lack of interaction with their human companion can cause the bird to become unfriendly and aggressive. Their need for excessive attention makes them unsuitable for first-time bird owners and their potential aggressiveness limits their viability for families with small children. Indian Ringnecks can be aggressive and territorial, so you should always plan on housing your birds in their own sleeping cage. They can get along very well with others of their kind if given enough space. If considering other species make sure that they are sized appropriately. Strong bonds will be formed with their human companion by these birds, with the females generally forming stronger bonds. They love to ride around on their human’s shoulder as much as possible. Socializing with all family members is a good practice to limit jealousy issues. 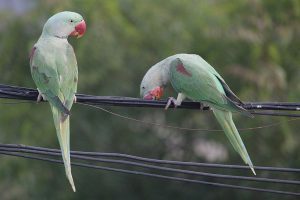 According to reptile-parrots.com, a distinctive behavior engaged in by the Indian Ringneck is the practice called bluffing. After weaning your bird will encounter this phase, which may last from a few weeks to several months. It is a period of increased aggression during which the owner should avoid having the bird on their shoulder. These intelligent birds can learn to talk and perform tricks. The best results will be achieved through positive reinforcement and gentle dominance exhibited by their human caretakers. They will attempt to take advantage of you if you let them, so be cautious not to allow any unwanted behaviors like biting to become a problem. A wide range of temperatures is tolerated by these hardy birds as evidenced by the wide distribution of feral populations. As they are very active, you should opt for the largest cage you can provide, as well as plenty of time outside the cage. The minimum cage size for a single Indian Ringneck is 24Lx24Wx36H inches (61×61.91.5 cm) with 1/2 to 5/8 inch (1.27 to 1.58 cm) bar spacing. Cages should be well stocked with interesting toys and chewable objects to keep your birds from becoming bored. Your bird’s intelligence demands adequate mental stimulation when you cannot give your direct attention. The bird’s diet should consist of pellets, seeds and fresh fruit and vegetables. It may take some effort to get your bird to accept the pellets, but it is worth it when considering the bird’s health. Molting is a yearly process and starts when the bird reaches approximately six months of age. Your bird may become a bit grumpy at this time. They love baths and should get the opportunity as often as possible. Nail trimming may occasionally be necessary but can be minimized by employing some concrete perches. How Healthy is an Indian Ringneck? With proper care, your Indian Ringneck can live 25 to 30 years in captivity. They are generally hardy birds but can suffer from Polyoma, fungal diseases, and bacterial infections. They can also be prone to vitamin A deficiency which can be addressed with diet changes. How Much Will an Indian Ringneck Cost? Indian Ringnecks cost about an average of $400 – $500, with some exotic mutations costing more. You want to make sure you purchase a hand-raised bird as birds raised in a colony may never become fully tame. You will need a roomy cage and plenty of toys and perches that can be rotated and in some cases chewed up and replaced. Food requirements are not excessive by pet bird standards. Is an Indian Ringneck Right For Me? You need to be able to give this bird a lot of time to keep it tame and friendly. It is more demanding than many other parrots, and should probably not be the first bird you own. Its challenges do have their rewards, and an Indian Ringneck can make an excellent choice in a pet parrot for the right owner.